As published in the February 1998 issue of Flight Journal (with minor editing). Used with the permission of the author. I radioed the flight-test engineer in the control room at the Lockheed Flight Test Center and said, with more that a little trepidation, "Larry, I'm sure I followed the flight-test procedures you detailed me on the mission profile card, but as I reached the first test point on airspeed, angle-of- attack and yaw input, the plane went crazy; it snapped into an inverted nose-down roll. It really surprised me; it took me over 9,000 feet to recover. Remember yesterday; it didn't act like this at all." I was a Lockheed experimental test pilot on the development of the F-104 Starfighter, the world's first jet fighter designed to fly more than twice the speed of sound. Lockheed Aircraft Company hired me because of my experience as an Air Force test pilot at North American Aviation, flying out of Los Angeles International Airport, on the development of the F-100 Super Sabre. The F-100 was the first supersonic fighter to move into mass production. As a Lockheed experimental pilot, I felt I was part of the legacy of famous aircraft and intrepid men. Lockheed designed and built the P-38 Lightning for WW II. It became famous in the Pacific theater of operations. Lockheed also designed, in its renowned "Skunk Works," the F-80- the first operational jet fighter. I flew the Shooting Star, as it was named, both in gunnery training at Nellis AFB and in Korea in preparation for my first combat mission. The F-104 was born in Kelly Johnson's famous "Skunk Works" the design aim was to produce a supersonic fighter that would have a performance capability in excess of Mach 2 and combat altitude of over 60,000 feet. So, although I was a lone in the cockpit, that day trying to figure out what went wrong at 30,000 feet, I was in the company of esteemed designers, builders and widely known experimental flight test pilots. "Not like yesterday at all," as I stated earlier to Larry, meant that I had flown this specific stability and control test the day before and everything had gone according to the flight test plan. But the electronic mechanism designed to send signals from the test aircraft to the control room had malfunctioned; none of the data collected was usable for studying past performance before planning the next experimental flight. When you hear about aircraft accidents today, the familiar word is the importance of recovering the "flight data recorder." Well, 40 years ago, it wasn't as sophisticated; therefore, I was asked to do the experimental test over again. I agreed to do so. I took off, climbed to 30,000 feet and started my experimental flight. I controlled the aircraft as precisely as called for on the flight test card. I was less than 40 seconds into the test, when wham, the plane snapped into a pitch-up and inverted roll. It was then that I radioed Larry, after I got control of the plane and myself! "OK," I said to Larry, "maybe I did something wrong. I'm going to try the test once again, but if it reacts the same, I'm coming home. I'll climb back to designated altitude, and I'll talk my way through. That way, we'll both be able to try to determine the unusual behavior of this lady with, it seems to me, an agitated composure." "That's a good idea," said Larry, "but everything seemed to go so well yesterday. Hope nothing is wrong." How soon we were to find out! "Roger," I remarked, as I leveled off at the proper altitude. "I'm ready! I'll talk through each step! OK! Here goes! I'm at altitude, attaining-there I am-at the indicated airspeed as called for, angle of attack coming- coming-there it is-holding angle-of-attack-airspeed OK, here comes the rudder-more-more-WOW! Why so much rudder? Damn it Larry! Here I go again!" I yelled. "I have a vicious pitch-up! I have a huge roll input! Going crazy-I'm upside-down-the plane's going crazy!" The nose had yawed right with horrific violence. Everything became a blur as the plane tumbled out of control toward the ground. I said to myself, "This is crazy; this isn't me, this is terrifying!" For a nanosecond, my first combat mission flashed before my eyes, with the terror I experienced in seeing flak and tracers, and realizing for the first time that the enemy was trying to shoot me down with the intention of killing me! Now this @#%*_?&# plane was trying to do the same thing! I couldn't talk anymore. I had to get control; the airplane had stalled out. I was about 60 degrees upside-down and yawing. I didn't even know which way, I was so disoriented, but I knew I was heading down-fast I didn't move the stick or push either rudder pedal. I didn't advance the throttle; I quickly checked the exhaust gas temperature and the rpm gauge; the engine had not flamed out. "Take it easy," I said to myself. "Take it easy-don't fight the controls. You have altitude-let it go-let it go. OK now, roll it upright-little roll input-easy-easy-little rudder-whoops! The other way-easy on the stick-check the tuck-little more roll-little bit at a time-just a touch of rudder-just a touch damn it! Don't know what's wrong-little bit-little bit . " Slowly, ever so slowly, I started to lead and the lady was following me; we started our majestic waltz-gliding on thin air. I had talked her out of her determination to fatally test the law of gravity. I finally had number 55-2962, the eighth YF-104A manufactured, flying level. She had an "eight ball" tattooed to her right side. I had lost 16,000 feet. Yes, I had literally been "behind the eight ball." I called Larry, gave him the particulars, and told him something was definitely wrong. I didn't know what it was, but I knew something was amiss; so much so that I instinctively started to climb and head for the dry lake at Edwards AFB. The dry lake had saved me many times during past test flights when things were not functioning properly, particularly with the new YJ79-GE-3 (General Electric) engine; a beautifully designed, but, what turned out to be, an extremely vexatious-and deadly-engine. In experimental flight tests, we were stretching the state of the art for an innovative fighter. Everything was new: new design of aircraft, new engine, new variable guide inlet guide vanes, new main fuel regulator, new type of afterburner, new altitudes never explored, and speeds never researched. It was the first time in any aircraft that the engine was combined with a fully variable duct system that could adapt itself to all contrasting conditions from takeoff to Mach 2.2; at least it was supposed to. The F-104's wings were also unique, tailored purely to the supersonic regime-extraordinarily small span and area-without sweep. 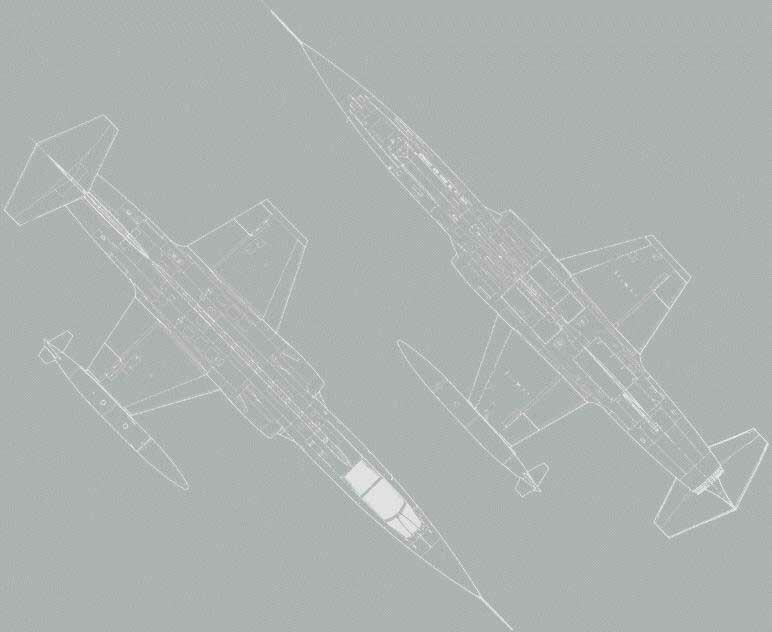 The next time you take a look at the new generation of fighters-the F-14, the F-15, the F-16-look at the leading edges of the wings. They look like Mt. Rushmore to the F-104's 15/100 inch thick leading edges. The Starfighter had a new radar and a new gun. A new pilot's handbook had to be written, meaning new operational and emergency procedures had to be written and tested. Front line, air-to-air combat pilots convinced Kelly Johnson to go for performance at all costs. The result was one of the most startling airplanes ever built; the "missile with a man in it," as it was called. A far as moving at high speed in a straight line, it had few rivals. But nothing worked as designed. More than a dozen times, I would be in the throes of an experimental test flight and the engine would flame out- just flat quit-for no apparent reason. I would get the engine started and gingerly head for home. Sometimes, no, many times, I couldn't get the engine started again, so I hurriedly took the option of the dry lake bed at Edwards (the same dry lake bed where the space shuttle first landed 25 years later) and landed the aircraft "dead stick." That five miles of lake bed gave us both lots of room. Was the lake bed going to save me one more time? I headed toward Edwards for a couple of reasons. I was too far away from Palmdale in case of an emergency; experimental pilots aren't paid to eject out of every test vehicle that presents a sudden, unknown problem. Also, Edwards (named after an experimental test pilot who died in the crash of a flying wing) is a wide-open lake bed that would give me options for direction of landing and a high indicated airspeed on final approach. I planned to avoid any pitch-up, yaw and roll situations. One Lockheed test pilot had recently been killed in a 104 during a flare-out at landing-the "eating an ice cream cone" maneuver used to decrease sink rate just prior to touchdown. It had pitched-up and catapulted while rolling to the right, spewing pieces of airplane and fire that tumbled and reacted explosively along the edge of the runway and into the adjacent field. I was there and saw the results to both pilot and plane. We still hadn't been able to confirm why it happened. We think the plane stalled and pitched up, yawed and then rolled uncontrollably to the right. If I could help it, I wasn't going to let that happen to me. I reached what I thought was a safe altitude, called Larry and told him my plans. He told me to switch frequencies so Lockheed could monitor my approach to Edwards. I gave him a "Roger" on that and radioed Edwards. "Edwards tower, this is Lockheed test 2962-over." "Roger 2962; go ahead," came the instant reply. "Edwards, 2962 is declaring an emergency although it is not a mayday. Request landing on the lake bed at speeds above normal; not sure of my direction as yet; don't want to make too many turns; not sure when I'll drop my gear; would appreciate, however, fire truck following, over." "Roger 2962. Wind is light, varying north to northwest at 5 knots, altimeter 30.01." "OK Edwards. I'll have to make a 90 toward the north-will call about three miles out on final-straight in toward north." "Wind's not that bad and I don't want to move this thing around too much," I said to myself. "I feel like I'm encased in an eggshell." "Edwards," I radioed, "I'm presently at three one thousand feet west of Barstow; parallel to 58 [highway 58]; have Harper Dry Lake at one o'clock. I'm on the letdown." "Roger 2962," came the reply from Edwards. "Keep us informed. I understand Lockheed is monitoring this frequency. The fire trucks are rolling." Fire trucks! That sent a chill though my spine. I gingerly started to lose altitude, pulled the throttle back to about half quadrant and cracked open the speed brakes. I had descended about 2000 feet when I ran into a rumble of clear air turbulence. I inched back on the throttle and instinctively closed the speed brakes to reduce buffet. I told the tower I was in CAT; I knew Larry was listening. I then said to myself, "OK eight ball, take it easy; we've been through a lot of things together. We'll get through this. Take it easy." But just as I looked down to check the airspeed indicator, the nose violently pitched almost straight down and continued to move through 90 degrees. I was starting to tumble. I called "Larry!," as I was pulling hard, real hard, back on the stick, "I've lost control! I have zero pitch input! I've got to get the hell out! Now!" At that instant, I reached for the ejection ring between my legs with both hands and pulled as the aircraft continued to tumble. Boom! I was out, ejected upward, upside-down at 27,000 feet. I might explain. The F-104 was at first designed with a "downward" ejection seat because it flew extremely fast at low altitude where, of course, the air is dense. Any ejection, up or down, at high speed would be like hitting a brick wall-a thick brick wall-at 700mph. No question: that's Excedrin headache number 1! The seat ejection systems at that time were not powerful enough to eject the pilot "upward" for fear of jamming him, due to high pressure, into the horizontal and vertical tails, each having a leading edge with a .01-inch radius. I wasn't ready for sliced "Suitcase"! Thus we ejected "downward." It's a funny thing about life; or fate. Three of my test-pilot friends were killed in the F-104 when they were forced to eject close to the ground. The ejection system didn't function for them at low altitude or they were too close to the ground when they made their decision to eject. I can still remember the powerful, full force of rushing air-pinning me to my seat-like going downhill in the front seat of a mile high roller coaster. Only this blast was instantaneous; it hit me at about 450mph. One second after I ejected, the lap belt separation system worked; it blew the belt in half and freed me from the seat. For a few seconds, the seat and I were inches apart floating to a stop as we reached the apex of our arc. A lanyard, one end attached to half of my seat belt and the other end attached to a pin in my chute, seemed to be hanging around, slithering like an eel in water. Then the seat drifted, or fell, away. The eel became a frozen rope and pulled the pin that armed my parachute to open at 15,000 feet. I started to roll and tumble and corkscrew for about 10,000 feet, like an oak leaf being blown from a tall oak tree in a vicious windstorm-sway and tumble, no control, no power over anything, no stability, just another body simply subjected, nakedly to the divine agency to which the order of things is prescribed. Would I be a favorite son, or a fatality? Would I be vicariously and rudely shoved back in time to Greek mythology and become Icarus and fall to my death by flying too close to the sun; or would I become the winged horse Pegasus carrying the thunderbolt of Zeus and be allowed to live and, like he, be captured by my Bellerophon (Lockheed) and continue to ride through many adventures? Speaking of thunderbolts: what the hell happened? This isn't me, falling through space hoping my chute will open. Where's the ring for manual opening? Where are my hands? What happened to my airplane? Was "eight ball" angry with me? Did I step on the lady's toes too often? My thinking was interrupted with an abrupt, cruel and intense punch to my crotch and chest. My chute opened with a vicious snap, a whoosh, a big shaking, followed by a smaller one: it was extremely violent. I was a rag doll in the mouth of a giant killer lion, and then he dropped me-plop! And there I was! Hanging by two leg straps and a chest belts-15,000 feet in the air. I was stunned-this wasn't me-I'm having a nightmare! I'm dreaming-Clark Gable and Spencer Tracy and a snazzy blond in "Test Pilot." But then, a sudden reality; the wind came, wheezing through the shrouds rocking me back and forth, back and forth. I was in a backyard swing, only I couldn't put my feet down to stop it. I was afraid to look down, but when I did, it was most frightening-oh my God!! Would those straps hold me? Will I fall out? I still had about 12,000 feet to go: My first experience in a parachute. I will never forget it! I looked around. I could see San Bernardino, Barstow, Edwards, Lancaster, Palmdale, and the Valley-all those places and hundreds of thousands of people; yet I was all alone. I looked at my legs and arms and hands. I moved them. My hands were holding on to the rigging with a tighter grip than snap-on pliers. I wasn't about to let go. Somewhere along the line I had lost my left glove and my watch; my flight suit looked like the remains of a flag flown at full mast during a hurricane. It was in shreds. But my helmet and oxygen mask stayed with me; I was sucking, rather readily I might add, emergency oxygen. My laced up boots were still on my feet. I looked down and moved my head around. I didn't dare make a body turn; didn't want to disturb anything. The wind still had that eerie sound as it continued to pick its way through the shroud lines. It reminded me of "intersanctum," but that was a squeaky door. I really felt depressed. How could this happen to me? And I started to think, "You're in the big leagues now, Suitcase. This is serious stuff, ejecting out of an experimental aircraft. You're not a `flyboy' anymore. You are dealing with a very profound, abstruse, difficult subject matter-this test-flying stuff. It's beyond the ordinary knowledge or understanding of almost everyone. Most people think of you in a leather jacket and a white scarf in the company of glamorous women. No glamour here. You better pray it wasn't your fault because of a dumb mistake." I was looking for smoke from my crash-nothing!! I remember thinking that I hoped a United Airlines DC-6 wouldn't run into me. Why United? Why a DC-6? I have no idea. I looked down. "Wow!" I said to myself, "I'm coming down pretty darn fast, I better get ready for a sudden stop." I don't know at what rate of descent I hit the ground; I went from so many feet per second to stop! Just like that! I do remember, as I neared the ground, seeing a small ranch house, or cabin, with clothes hanging on a wash line. A blessing! The clothes gave me an indication of which way the wind was blowing so, when I hit the ground, I would be prepared to get up and run in the direction of my chute and grab the lower shroud lines and collapse it. Sounds good! That's what they do in movies. But everyday life is serious play, and your never given any time to practice. This was my first ejection and parachute ride, and I was never given any in-depth lectures or practices in landing-in a harness, say, by jumping from a tower as you see in the training movies. The clothesline was strung from the roofline of the cabin to a pole about 30 yards away. It was high enough to help me in my depth perception. When my eyes were even with the clothesline I closed them, tucked in my legs a bit, went limp and waited. Whomp! I hit the ground-hard. The chute did not collapse; the wind was stronger than I anticipated. And let me tell you, there was none of this get-up-and-run stuff; I was being dragged. I managed to roll over onto my stomach, used my elbows for speed brakes-I still have the scar tissue-and slowly crawled forward to shorten the distance to the bottom of the chute. I finally managed to get it to collapse-then I did too! In a few long minutes, I sat up and looked around. Nobody came from the cabin, but I was more concerned about what had happened to the aircraft. I kept thinking! My God! What if I was responsible?! This really isn't happening! I'm going to lose my job! Is my experimental career over already? I also was looking for smoke from the wreckage, but there was nothing except a lot of dust and haze on the 360-degree horizon. The wind was getting stronger-blowing from the west. I pulled in more of the chute. I was alone in the middle of nowhere, sitting in a dusty, dried-up, brown, grasslike field and my back was killing me. I decided not to move, Lockheed would be looking for me by now anyhow. I unhitched one side of the parachute risers and let the chute flare out. I heard a motor. It wasn't the sound of an airplane. I struggled to stand up and saw a truck driving toward me. It continued until it came right up beside me and stopped. It was driven by a farmer with eyes the size of an "on-deck" batter's circle. I had taken off my helmet, so at least he knew I wasn't from another planet--I think! "I seen ya come down from way off," he said. "took me a time to git here. What happened? Is you busted up? You one of them paratroopers from out yonder at Bicycle Lake? Wher'd yawl come from?" I said, "I don't know what happened. I just got here myself." My try at dry humor went directly over his head. "I'm OK, but I would appreciate a ride to the nearest town. I'd like to make a phone call." "Boy, ain't no towns `round here. Yawl in the middle of nowhere. This yous'd to be Alfalfa-ain't nothin' now. No water. As I says ain't no towns, but I kin take you to a country-like store. They got a phone outside. C'mon git in." "He," his name was "Gus," helped me gather my chute and helmet and off we went. I made the mistake of telling Gus my back hurt a little. From that time on, until Lockheed picked me up at the edge of a dry lake bed, Gus told me about his back troubles, his wife's lumbago troubles, his kids troubles and money troubles. On the way to the "country-like" he asked, "How much do you trouble shooters make?" "Hey, hey, hey! Yeah marriage is like jumping int'a a hole in the ice in the midd'l winter; you do it once and you remember it the rest of your days! Yer Smart! Got girl friends?" "Not enough! Although I am dating a blond right now." "What's `er name? She pretty?" "Her name is Jane and, yes, she is very pretty; she could make a bishop kick a hole in a stained glass window just to see her pass by." "Heh, heh, heh! Probably wanted to see mor'n that. Heh, heh! That's a good'n." "How long have you been married Gus?" "Heck man, I've been in love with the same woman for thirty-eight years. If my wife ever finds out, she'll kill me. Heh, heh, heh! Naw! Just kiddin'," Gus said, "I'm married to mah third one. Nice lady. Took on two of her kids, and I guess she liked that. We ain't got much money, but we git along. You seem I drive a tractor for a big rancher near'n Ridgecrest and, when I work, pay's pretty good. Long hours though." We were now bouncing along a dirt trail in Gus's pickup truck headed toward the edge of Harper Dry Lake. I had called Lockheed, collect. Ellie Hawks, the chief of all flight tests accepted the call. The conversation was surreal. "Hi, Suitcase. Where are you calling from?" "I'm out here at a crossroads gas station." "I dunno, somewhere south of Harper Dry Lake, so I'm told." I was beginning to realize that, for some reason or other, Ellie didn't know I had lost an airplane. I found out later that the guys upstairs in engineering were in a panic and Ellie had just returned from the bank or something; no one had had the chance to call him. "Did you have a breakdown or something?" "Yeah, Ellie, Your number eight airplane is broken way down-into a thousand pieces, is my guess. For God's sake Ellie, I just ejected from number eight." Dead silence for a long, long second! "Wha! What! Ya, ya, ya, mean ya, bailed out? Wha-wha-where?? What happened? Are you OK? Where are you calling from?? Are you OK? Can we come get you? Ca-ca-can you walk?" "Yeah, yeah, Ellie; I'm OK. I don't know what happened. I lost all pitch control. The airplane just pitched down and started to tumble on me, so I had to get the hell out. I had a nice guy pick me up; took me to this `Grapes of Wrath' junction." "Gosh, I can't believe it. Wait a second! Larry just walked into my office. Just a minute." Mumble, mumble. " OK! Can you get to Harper Dry Lake?" "Yes, I'm sure this man will take me. But I want to give him a tip: I didn't bring any cash with me." "Heck, don't worry about that. We'll pick you up in the Bonanza-within the hour." "OK! Great! Have Larry review the voice tapes with you. That's all we have left anyhow. See you in about an hour. And Ellie, I'm OK. Relax." "Hey! Wait! Wait! What's the number there? I'll call you right back." So in a few minutes the phone rang and, after discussing what happened in more detail and Ellie reaching his zenith of excitement and then calming down-plus knowing I was OK-Ellie told me my boss, famous test pilot Tony LeVier, was on his way by plane to pick me up. I suggested to Ellie to have Larry accompany Tony so he could brief him on the way. My conversations with Gus were vapid, passing the time as we drove, but he turned out to be a very nice man. And it helped me through my anxiety of being in the middle of nowhere, having lost an experimental airplane worth tens of millions of dollars and not knowing the reason why; that's what was haunting me. Tony landed the twin Beech on Harper Dry Lake and taxied to a stop, bringing a cloud of thick red dust with him. Larry, my flight test engineer, was in the copilot seat. I introduced the two men to Gus, and while Larry was helping with the chute and helmet, Tony took me aside and said, "Don't worry, Suitcase, we think we know what went wrong. Larry and I could see the wreckage from the air. We saw the hole the airplane made, then the ripped off tail section and a finally the mangled tip tank. It looks like the tip tank was torn loose due to the clear air turbulence you reported. It probably wasn't installed correctly. It then, somehow, jammed into the tail and cut through it like butter. It reminds me of the fatal accident we had at Big Spring in a T-33; the tip tank came off and tore into the tail. Only the instructor was at low altitude. Do you remember that?" "How could I forget? The pilot was one of my instructors." "Anyhow, we think that's what caused your tumble; thank God the ejection seat worked perfectly. We have some experts on the way to the sites now; I radioed the coordinates." I was relieved, but depressed. How could something like this have happened? I asked Tony if he had a few bucks. He went over to Gus and thanked him, and then we said our goodbyes. When Tony shook Gus's hand, his palm had a 100-dollar bill in it. Tony LeVier was that kind of man. When it was my turn I didn't say much, just shook Gus's hand, gave him a hug, turned and climbed into the airplane. When we arrived at Palmdale, I was given a big welcome, reported to the flight surgeon (my back was just a bruise and I was given a prescription for pain if it got worse), filed a tape recorded detailed report, and visited with Ellie, Tony, and Larry. Things were getting serious, we were loosing too many aircraft. I didn't know it then, but my time would come again. Tony flew be to Burbank. On the way, Tony told me my aircraft, the number 1 YF-104A Simpson's Appleknocker (my crew chief had painted a flying suitcase on the right side), which I had been test flying was still down for maintenance and would not be ready for another week. The Appleknocker was the first YF-104A off the assembly line as a test aircraft. He said "I don't want to even hear from you until a week from tomorrow." I went to my apartment a few miles from Burbank. I did go to the plant a few days later though. It took me a few days to recover any semblance of walking correctly because I had never hurt so much in my life: my neck, shoulders, chest, elbows, inner thighs, and even my rear end. I played tennis or worked out religiously every other day, and I thought I was in good shape. Tarzan probably could not have taken the abrupt tugs, pulls and shakes on his body without hurting in the same way, and he had a Jane who worried about him, too! Anyway, I had our flight-test secretary type a letter for me thanking Gus. I wanted it on Lockheed stationary. I also packed a model of the F-104 and sent it to him-with the tail on! Tony talked to me while I was there. His first premise turned out to be true. The tip tank had been installed improperly. The rest is history. He didn't offer to show me the pieces.